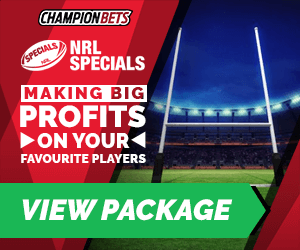 Steve Green has been at the helm of NRL Tips for Champion Bets for three seasons and he continues to rack up strong results. 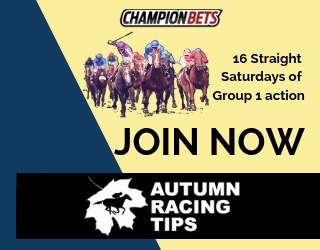 2018 has started with bang and after seven rounds Steve has managed to notch up $2582 in profits for members. It’s been a long journey to get to this point for the NRL specialist. Over the years he’s built up a solid approach to finding an edge that relies on statistics and nous. He’s also spent time working on the inside at various bookmakers, so we thought we’d dig a bit deeper into exactly how he generates an edge. How did you first get introduced to the world of punting? My uncle took me to the races when I was a 10-year-old kid and I was allowed to bet $2 a race. 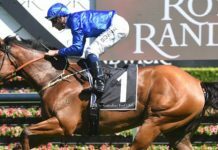 I backed a few winners and I was instantly hooked on the thrill of backing a winner. Around the same time, my Mum would bring home the rugby league footy tipping sheet from her work and my brother and I would fill it out for her. I remember some weeks we went well and that was when I started really loving the idea of tipping winners in sports betting. But it wasn’t until I was in high school and I started learning about probability that I saw the serious side of punting. I was ok at Math, but I was very good at Probability. I quickly realised that if you could properly assess the probability of an event, then you could accurately say what the odds should be. About a decade later I was working at Canbet sports bookmaker in Canberra while studying law at the Australian National University. Some of the best punters in the world would bet at Canbet and their discipline and amazing win rates got my attention and admiration. This was my first real exposure to the world of sports betting and that was where I started to first develop a system for NRL betting. Were you always interested in betting on NRL or have you ever bet on racing or other sports? I was interested in racing and while I casually enjoy sports like cricket and UFC, I am overwhelmingly focused on the NRL. I would say that out of the money I have wagered in my life, 99.9% of it has been bet on rugby league. 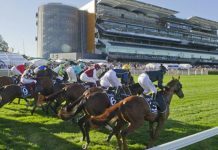 However, when working at Canbet, I did pay particularly close attention to what the professional punters did on sports like the NFL, MLB and NBA. My focus was solely on the statistical side of these sports and once again, I would say that out of all of the sport I have watched in my life, 99.9% of it would be rugby league of some description. While I understand that there are successful punters that can cover a range of sports, I think my edge in the NRL comes from the fact that I live and breathe the sport. I watch so much of it that I am able to make informed adjustments to player ratings derived from a small amount of data (such as on new players or players returning from injury. I find sports that I follow closely are hard to bet on because of the emotion involved. How do you keep that separate? It has taken me many years to get to the position where I can look at my betting on rugby league as a business and that realisation simply comes with maturity. There is no use screaming at the screen when you lose a $1000 bet due to a refereeing error in the final minute of the match and so I know that keeping my cool is crucial to ensuring I don’t make mistakes by being angry. In this regard, I think playing poker has helped with my temperament. In poker, if you lose your cool after copping some bad luck and start making poor decisions, it is called being ‘On Tilt’ and I have seen people self-destruct by not just walking away and cooling off. If I cop a bad beat in NRL betting, I will walk away and go play with my daughter or make a coffee and just clear my head. This ensures I don’t bet with my heart and keep using my brain in a rational way. To be perfectly honest, being a winning punter over the long-term also helps, as I know I have an edge and that I will win in the long run. Sometimes, if I am 0/2 after the first two bets of a round lose, I remind myself of the number of times I have been in this position and ended up with a winning round of betting after winning the remaining plays. 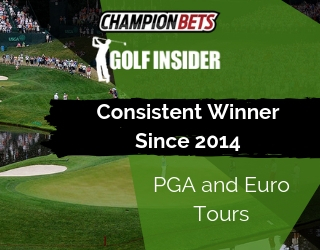 Can you tell us a bit about the approach you use to find a winner? I use statistics as a base to rate every player in the competition and I overlay this analysis by looking at the form trend of a team. If you do not know how good each player is, then you are going to be led astray by public opinion on how good or bad a team is. For example, when people continue to talk about a former rep player as a ‘star’, I am more than happy to call it as I see it, and point out that the player is a shadow of their former self. On top of this, I look at the draw difficulty of each team and market psychology (such as when the punters are backing a fairy tale story and ignoring the evidence). For example, the market continues to predict that the Roosters are about to start winning their games by 50 points, and we keep betting against the Roosters with some good profits to show. Once again, being bold and relying on evidence is at the core of my strategy. More recently, I have also started to pay a lot of attention to the way in which the rules of the game have been enforced. 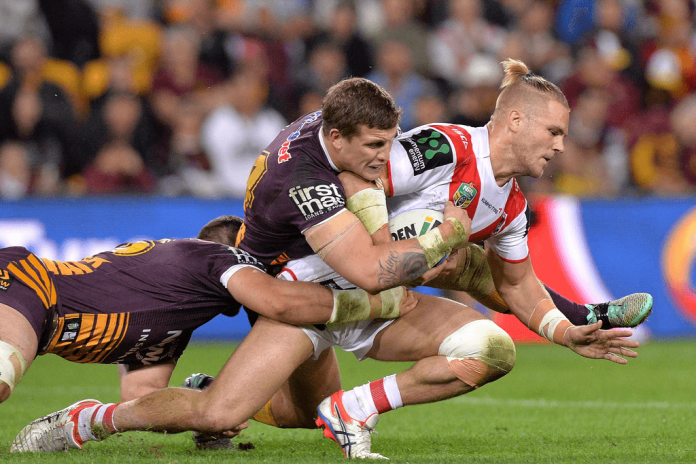 Lots of commentators, fans and NRL teams themselves were seemingly blindsided by the crack down by the NRL on strategies such as deliberately conceding penalties to slow down their opponent’s attacking momentum. But the NRL announced they would be doing this, so I intentionally stayed away from betting on teams that have used this tactic in the past. How much of a role does database analysis play in what you do? The thorough analysis of data is the foundation of my approach. Without an objective approach to ratings players and teams, humans are too prone to making errors based on subjective miscalculations. For example, a book called “Thinking, Fast and Slow” by Nobel prize winner Daniel Kahneman highlights several decades of academic research to suggest that people place too much confidence in human judgment. When humans rely on their instincts, they fail to make accurate decisions due to a range of systemic biases. Overrating an established player because of their good form is previous seasons. Too often I see a 32 year old former star being praised for their past achievements and their recent form slump overlooked. Underrating a young player because of limited playing time and poor performance this season. Too often I see a younger player written off after their first three games worth of data indicated that they were struggling. When you’re watching a game, what sort of things are you looking for that might provide an edge? As you would expect, I monitor statistics when the game is being played to look for things such as how much energy a team has had to use in tackling and how many tackles a team is missing. I also pay close attention to how teams are conceding tries. If they are being easily beaten with back line moves, then that is a sign the team is in real trouble. Whereas tries conceded because of excellent kicks or rare / unlucky errors is less concerning. I also like to know if a team suffered a lot of injuries, as sometimes a losing team may have lost because they had players injured and so there may be value on offer for them the next week. I noticed you study the referees. How does that help generate an edge? Understanding changing rule interpretations is crucial in the NRL. The referees have such a big impact on the flow of the game and by knowing what style of refereeing is likely to occur, you can get a real edge in markets such as total points. For example, with referees now much more willing to send a player off for 10 minutes in the sin bin, I have not taken the under option in Total Points as often as I would have otherwise. This is because the tactic of giving away penalties to stop tries being scored is no longer as effective as it was in 2017, plus now teams are being forced to defend with 12 players, which will often inflate the number of points scored in that game. It is also important to understand how each referee’s particularly style of officiating differs. 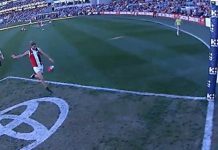 Some referees blow a lot of early penalties and crack down on certain things…. others don’t. Sometimes a referee’s style is not well suited to a strategy being employed by a team and so knowing this can often be the difference between winning or losing a bet. How would you suggest that new punters go about finding an edge in sports such as NRL? I would start by trying to look at where bookies may be making errors with their pricing of NRL markets. 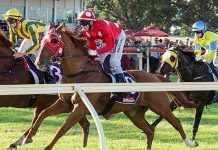 If you find that bookies are pricing things accurately in certain markets, then perhaps you are better served by looking elsewhere, as the way to make money is to be better than the bookies. If you do spot an area where the bookies are off the mark, you then you must ask yourself ‘why’ the bookies are making the error. If you can identify this, then you are well on your way to becoming a winning punter. The next step is to work out ‘how’ you can avoid making such an error and then building a model or a theory to try and generate your own prices for the relevant market. In simple terms, that is how you find value in any market. More specifically though, it takes a lot of hard work. 1000s of people have been before you and not spotted these errors, so it will not come easy. Since I started in this caper, I have spent 1000s of hours looking through spreadsheets, watching football and searching through bookies markets. The idea that you can do this by looking at the teams and going with your gut after 10 minutes of thinking is just plain wrong. I would also suggest that new punters read as much as they can about probability and gambling… as well as other subjects such as investing and finance. In my opinion people do not read anywhere near as much as they need to really understand something. Often, I have been reading a book about something totally unrelated to punting, but managed to pick up something that can be transferred to punting. You also need to record all your bets. Anyone who is not recording their bets is not being serious about it and in the long run, you will lose. 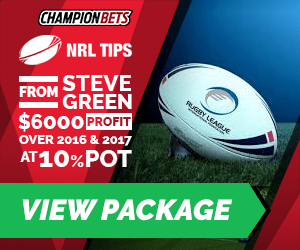 Steve Green has already made NRL Tips members over $2,500 this season, with another five months of rugby league still to come. 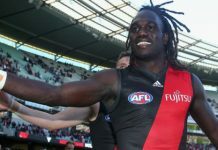 What’s more, Steve’s four Futures bets are in good shape with the Dragons being the form team of the competition through the opening two months.